The jury is still out, as I write these words. Its verdict may be in by the time you read them, and there's a blog with the latest news--but that's okay because the point of this article is not to comment on the trial's outcome but to show what government had to do, in order try to silence an influential advocate of freedom. Its conclusion will be that government is wholly unfit to operate a justice system and entirely incapable of being constrained, e.g. by a constitution. Both those themes have been struck here before, the second for example here--but from a theoretical viewpoint. Here, I prove them true in practice. 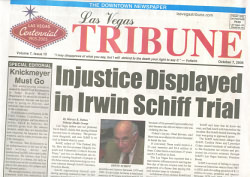 The scene is Las Vegas and the trial, that of Irwin Schiff and his friends and employees Cindy Neun and Larry Cohen. None of them profess to be anarchists and all accept, approve and willingly pay taxes that are enacted into law; but thirty years of research have convinced Schiff that the US "income tax" has not been enacted into law. I happen to agree--but again, it's not my purpose to argue that point; rather to show what government does to try to suppress such a conclusion. All agree that by publishing his findings and showing how to frustrate the IRS ' attempts to collect a trillion dollars a year despite the perceived absence of legal right, Schiff has cost the FedGov many billions of dollars; and whether he's right or mistaken, that's an achievement to put all of us to shame. It's several billion dollars' worth of evil, havoc and mayhem that the government could not wreak--thanks to the efforts of one good man. The FedGov's endeavors to prevent anything but the vague semblance of a fair trial were funneled mainly through the federal judge presiding--one Kent Dawson, may his name forever live in infamy. Here is some of what he has done, to preserve the revenue base of his employer. Before the trial began on September 12, 2005 , Schiff had entered six "Motions to Dismiss." These are powerful legal arguments, presented to Judge Dawson and the prosecutor, for the latter to try to rebut and the former to take action. They were published on Schiff's website as documents of public record, so I have copied them to mine. Motion #1 argued that while "Congress conferred civil jurisdiction on federal courts with respect to Title 26 [that Title contains all of federal tax law] it never conferred jurisdiction on Federal Courts with respect to alleged criminal violations of that Title." In other words: go away and play, you have no business here. Surprising? Go read, and judge for yourself! Obviously, jurisdiction is fundamental; if Dawson 's court had none over this case, he was not entitled to proceed any more than a Connecticut court can try a case of murder in Shanghai . Motion #2 moves the court to dismiss all charges on the grounds that "no statute makes defendants or anyone else liable for an income tax . . . this court can have no subject matter jurisdiction to conduct a trial over an alleged tax for which no statute makes anyone 'liable'." Even more surprising? Again, read it and judge. Later, in the course of the trial, Schiff cross-examined the government witnesses and not one of them knew of a statute to make anyone liable for an income tax! Motion #3 argued that the government's case must be dismissed because "the income tax is not directly 'traceable' to Congress' Constitutional power to 'lay and collect taxes'." Sounds complex, but this is basic to Schiff's understanding of why the i-tax has not been enacted into law, nor ever can be. In Motion #4 Schiff reasons that two of the charges against him are "fraudulent on their face" and should be dismissed for that additional reason. Another surprise here: he shows that "there is absolutely no mention of the IRS in Subtitle A" (the bit that deals with income tax) and therefore it's impossible for him to have "impeded, obstructed and impaired the IRS in . . . collecting" them. Common knowledge says the IRS does have the power to collect income tax; in this Motion, Schiff reasons that that common knowledge is dead wrong. In Motion #5 Schiff moves to dismiss charges on the grounds that much of the evidence was gathered illegally; in a raid on his office conducted by government goons who had no statutory authority to conduct one. Again, common knowledge holds that IRS agents can do almost anything. Read it: this motion argues that they have no such legal power. Lastly Motion #6 holds that Schiff's entitlement to a "fair trial" under Amendment 6 is impossible because "the reality of my situation is that this Court cannot allow me to prevail on any basis since it perceives what that might do to the government's ability to collect income taxes, which it also perceives as the very 'life blood' of the government it serves" and so, again, that all charges should be dismissed. Whether the present reader finds those Motions persuasive or not, nobody can disagree that they are tightly reasoned and demand either acceptance or well-reasoned rebuttal. They got neither. All six motions were "denied" by Dawson, by fax sent two business hours before the trial was due to start and without any stated reason--in a 3-page ruling that commented only that if Schiff were right, it would mean the entire Federal Government has for decades been conspiring illegally to remove scores of trillions of dollars from the American people, and of course that's absurd. But duh, that's precisely what Schiff has been saying, ever since his best-selling "How Anyone Can Stop Paying Income Taxes" was published in 1984, and what he encapsulated in the title of a later book, "The Federal Mafia"! So he got the message - but, being himself a key part of the scam, called it ridiculous instead of highly credible. Supposedly, criminal trials in Anglo-American Law are adversarial; with a prosecutor and a defendant competing and a judge to provide each with fair opportunity to present his case and with a jury to decide who's right. It's a given that the judge must have no "interest" in the case, so as to keep the proceedings impartial. Yet here, the presiding judge was being paid over $160,000 a year by the client of one of the two parties, and his future career was wholly dependent on an outcome of the trial favorable to that party, and his freedom from a damaging future IRS Audit might likewise have been contingent on his performance in securing one. The first betrayal of judicial impartiality occurred on the first day of trial. A Schiff supporter called Guido was found in the court house distributing FIJA literature, to explain that jurors have for 800 years had the power to nullify laws they judge to be bad or inapplicable, and to over-ride the judge's instructions. Guido was arrested for "jury tampering" (oh, no!) and subsequently released on condition he left Nevada at once. As we'll see below, Guido's message was highly appropriate; not because in this case there is any law to be nullified (Schiff repeatedly says "the law is just fine") but because this jury urgently needed to stay independent of Judge Dawson's bias. The second was that jurors were selected only from a list of registered voters; that is, a set of people who had already affirmed their belief in a system of governance involving the use of initiated force against their neighbors. Such tampering is always done in every government court, and brings at once a heavy and obvious bias against any defendant with an opposing belief. The third was vicious, and repeated daily throughout the trial, and concerned the core of Schiff's defense - which was, of course, that he had relied upon the law itself, and found none to compel the payment of a tax on what ordinary people earn. Dawson ruled that Schiff was not allowed to refer to the law during his defense--that he alone would instruct the jury on what the law says. In that one ruling he bound the lead defendant's hands behind his back and applied duct tape to his mouth. Schiff tried to refer to the law anyway, and was sentenced to one day in prison each time; thus, should he be happily acquitted, he will still "do time" for having had the impertinence to try to obtain that acquittal the only way he knew how. The defense was pro-se (for each was sure (s)he knew more about the law than anyone trained in a government-approved law school) but each was assisted by a court-appointed attorney; those attorneys heard that ruling with dropped jaws. Each said that in all his experience he had never seen or heard the like. They were getting a free education, in the realities of government "justice." The fourth occurred on October 11th when Angela Stark, a Schiff supporter, heard a gross lie from some government witness and spontaneously called out "OBJECTION!" from the spectator benches. She was immediately removed from the court house and banned from re-entry - so violating her right to speak freely under Amendment 1 as well as her right of remonstrance under Amendment 9. Such pesky limits on government power are ignored whenever it matters. In the fifth, Dawson prohibited defense witnesses from testifying to anything but the good character of Mr Schiff, thereby blatantly violating his right, "guaranteed" by Amendment 6, to obtain "witnesses in his favor." This, likewise, totally astonished the assisting attorneys. Here's how it worked, for the dozen or so witnesses who were ready to speak. John Turner was eager to say how he had worked for ten years as an IRS Revenue Agent, but that his employer had never trained him in the actual, applicable law and so had been deceived into ruining the lives and businesses of many honest Americans; that when in 1997 he heard Schiff explain which way was up he did that research and rapidly concluded he was correct. He immediately resigned from the IRS and has never filed a 1040 since. But the jury never heard Turner say any of that; he was prohibited, by judicial interference. Robert Schulz, President of We the People, was ready to testify that his organization had repeatedly appealed to Congress and others for answers to key questions about income-tax law, but had again and again been refused any reply; that WTP had now adopted the policy "No Answers, No Taxes" - but he was prohibited from telling how coy were our Congresscritters. The jury never heard that. Joseph Bannister was ready to say how he had worked in a senior capacity for the IRS "Criminal Investigation Division" until he did his own legal research and was troubled to find the law in conflict with what his employers told him; rather like Luther's "95 Theses" nailed to his church door, Bannister fired off a memo requesting answers to a series of pointed questions. His boss told him to withdraw it or resign. He resigned. He then helped various others resist the alleged income tax and was tried for conspiracy this year--and was acquitted. But Dawson prohibited his appearance; the jury never heard any of that. Robert Wesley is a sharp-minded parole officer in Las Vegas and a veteran of the Schiff method of noncooperation; he knows how government bureaucracies work and was ready to testify that he had many times met IRS people and faced them down, never obtaining answers to critical questions. But he, too, was not allowed to tell that to the jury. Jan, an FBI Agent, was poised to testify that he has studied Schiff's findings and used his procedures for i-tax nonpayment for several years, but has never found anything criminal in them. Yet this servant of the FedGov's law-enforcement system was prohibited from giving that testimony. Several more of us were ready to stand and say that, prompted by Schiff's books, we had checked out his claims against the written law, found nothing incorrect, and then had used his procedures for declining to volunteer money to the IRS and found them effective. I was one, and in my case I could have added that in the first year, I even received a refund of what had been withheld the previous year. But all of us were gagged; the jury never heard those reports. Welcome to what Marc Stevens calls "Adventures in Legal Land ." Although their friends all hope it will, it will be astonishing if the jury, selected as its members were and with such vital pieces of evidence excluded from what they heard, decides to acquit these brave defendants. But whatever it decides, the government has revealed its nature. The net of it is that this month, in full public view (though the media, aside from a few articles in the Las Vegas Review-Journal and an outstanding front-page spread in the weekly Las Vegas Tribune, has been strangely silent, as if warned that IRS audits would follow any pro-Schiff reporting) the Federal Government has demonstrated with abundant clarity that whenever its financial survival is at stake, it will not hesitate to ignore any paper restraints that may stand in its way, and will use its monopoly over what passes for "justice" for its true purpose, which is to provide a veneer of morality over its monstrous exercise of raw power. There is, accordingly, no alternative: it is wholly beyond reform or redemption, and must go. Government is an institution that can never be limited, and that can never be trusted to judge right from wrong.